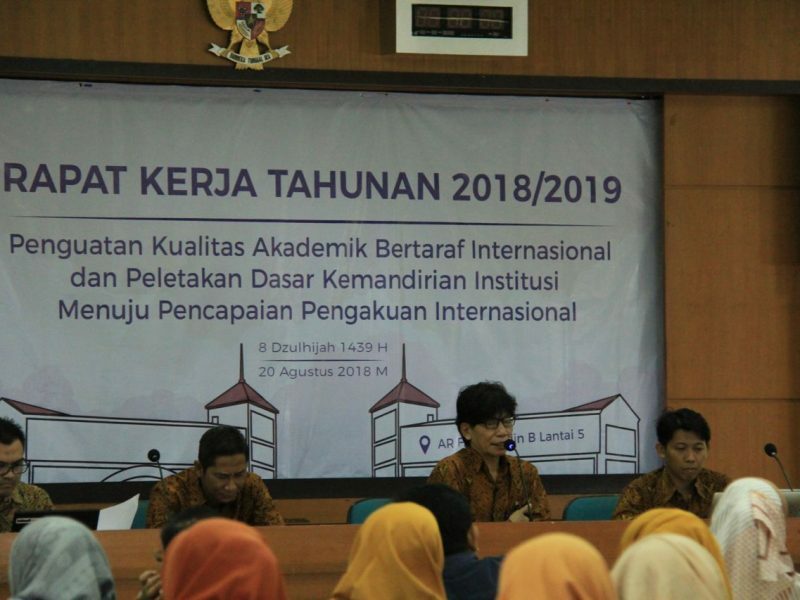 Universitas Muhammadiyah Yogyakarta (UMY) conducted RKT (Rapat Kerja Tahunan/an Annual Meeting) 2018 on Monday (20/8) under the theme of ‘International Academic Quality Reinforcement and Instilling of Institutional Autonomy Principles to Gain International Acknowledgment. At the opening of the RKT, Rector of UMY Dr. Ir. Gunawan Budiyanto, M.P. hoped that character building programs at UMY could be better. He also emphasized the significance of Strategic Performance Index so that UMY possesses quality as best as other 12 Muhammadiyah universities although UMY is only at the age of 37. The foremost point at the RKT 2018 was that UMY can globally compete in academic areas. A number achievements and targets have been arranged to the betterment of this university. Gunawan mentioned the achievements and targets in a plenary session I discussing ‘Strategic Goals and Policies 2018-2019’. In 2020, UMY is expected to be internationally well-known for its academic fields. To attain the goal, many lecturers have been invited in overseas events and several books written by UMY lecturers were published abroad. Meanwhile, 20 departments at UMY is accredited ‘A’ and four departments namely Department of Law, Department of Agrotechnology, Department of Management, and Department of Communication Science successfully maintained their ‘A’ accreditation with an increasing score. Indeed, Gunawan asserted the importance of accreditation score increasing. “Our focus is increasing the accreditation score, not merely accredited ‘A’,” he stressed. Another achievement was that UMY has seven accredited journals. This is vital for raising a citation score. “We are seeking accreditation for three other journals, namely a journal of Department of Law, a journal of Department of Communication Science, and a journal entitled ‘Berdikari’. Thus, there are ten accredited journals,” said Gunawan. UMY ranks 42 among Indonesian universities and quality improvements is expected to lead UMY to be top 30. To reach the goal, UMY should enhance human resources, particularly encouraging lecturers to pursue their doctoral degree and enforcing drop out for old students. It should be emphasized that undergraduate students must accomplish their study for a maximum of five years or they are expelled. “Getting a ranking of 42nd is considered ‘abnormal’ so that we have to rank 30 for top 100 Indonesian higher education institutions. Many lecturers may ‘love’ old students and this will affect our accreditation score. 4,324 students are from batch 2012 and under so that they should firmly be expelled. The students are not only undergraduate but also master as well as doctoral students. All lecturers are required to take an action toward 4,324 students,” insisted Gunawan. In 2019-2020, UMY can bear quality graduates through developing a great alumni system. To improve the quality, all departments are entailed to do re-accreditation by 1st January. “I welcome a national accreditation system by Directorate General for Higher Education (Dikti) 2019 commenced on 1st January 2019. Several departments at UMY must carry our re-accreditation prior to 1stJanuary,” commanded Gunawan.